Wearing cargo pants and want to conceal-carry in those pockets? No problem! 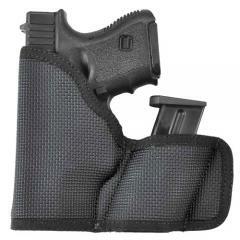 DeSantis has designed the ambidextrous Cargo Nemesis® Pocket Holster Model M52 for this very purpose. The M52 is constructed from a sticky fabric material for the exterior surface, ensuring a shift-free grip of thigh pockets. DeSantis' Cargo Nemesis® features solid reinforcements to keep it stiff and includes a smooth interior lined with pack cloth for a draw that has no friction. The Nemesis® measures 6.25 x 5-inches and accommodates both a firearm and a spare magazine. Very nice to carry in my back pocket of my bib overalls. For a counsel carry.